Southwest Airlines Co.’s industry position as the leading low-cost commercial aviation company is a result of following a mission statement and a vision statement that aim for the dominant competitive position in the global industry. The enterprise has a history of expansion where cost minimization is a core factor in airline operations management. Southwest’s corporate mission represents business strategic objectives that aim for leadership in terms of customer experience and relations, as well as the company’s approach to human resource management. These factors have significant implications on the corporation’s marketing strategies, regarding how the business presents itself as a practical alternative to other major airlines. On the other hand, Southwest’s corporate vision focuses on international leadership, revealing strategic planning for further expansion of operations. The vision statement and mission statement are primary guiding principles that shape Southwest’s strategies to grow and explore new opportunities in the global commercial aviation market. Southwest’s corporate vision applies the strategic goals of the company’s corporate mission onto long-term business operations and strategic management. Fulfilling the mission statement and vision statement requires strategies to overcome the competitive effects of other major airlines, such as American Airlines, Delta Air Lines, and United Airlines. The mission statement and vision statement indicate successful competitive positioning attributable to the business strengths and competencies shown in the SWOT analysis of Southwest Airlines Co., which involves low costs as a major strategic factor supporting business competitive advantages. Southwest Airlines’s mission statement emphasizes customer service linked to employee behavior and corporate image. The first point, involving high quality customer service, indicates the company’s strategic objectives for high standards of operations that relate to customer service, such as customer support and marketing communications for the commercial aviation market. Thus, the corporate mission statement focuses on customer experience as a variable in evaluating business performance, operational effectiveness, and strategies, such as the strategies used in Southwest’s marketing mix or 4Ps. The company’s mission statement also highlights the importance of desirable behaviors as factors that attract passengers. Considering these factors’ link to human resource management, Southwest Airlines Co.’s organizational culture is a major determinant in fulfilling the company’s mission statement. Southwest’s corporate vision depicts the company’s leadership in the global industry. The term, “world’s,” indicates the corporation’s plans to expand its airline operations internationally. To achieve a dominant global competitive position indicated in the vision statement, Southwest Airlines Co.’s organizational structure must provide the necessary flexibility for expansion. In addition, the company’s corporate vision statement includes a strategic target to become the “most loved,” presenting enterprise plans to achieve the strongest civil aviation brand in the world. The vision statement indicates that this industry leadership comes with Southwest’s top popularity and top profitability targets. Such strategic objectives require multinational expansion, which is a business growth opportunity, considering the company’s dependence largely on the U.S. commercial aviation market. Based on these points in the corporate vision statement, Southwest’s generic strategy for competitive advantage and intensive growth strategies determine how such global growth is achieved, involving strategies for new operations and for competing against other major firms in local and regional markets. Corporate Mission Statement. Southwest Airlines Co. prioritizes customer service in its mission statement, along with employee behavioral factors related to the company’s organizational culture. The corporate mission aims for the best customer service. Achieving this kind of leadership emphasized in the mission statement depends on competition, which can be assessed through a Five Forces analysis of Southwest Airlines Co. The company’s strategies impact this long-term goal in the global aviation industry. Southwest Airlines’s operations management strategies determine customer satisfaction, considering that operational effectiveness and efficiencies affect the speed and convenience that customers experience. Based on conventions on writing business mission statements, the company’s corporate mission statement is not satisfactory because it does not specify the nature of the business as a provider of air travel services. Southwest’s mission statement fails to include other details, such as the activities or approaches that the company uses or plans to use to achieve the top industry position for quality of customer service. Additional information that can enhance the mission statement includes the kinds of customers that the company targets, such as passengers in certain categories. Considering these issues, it is recommended that Southwest Airlines improve its corporate mission statement by including such additional information to make the statement more specific to civil aviation operations and related global strategic targets. Corporate Vision Statement. Southwest specifies strategic objectives to become a global industry leader. For example, the company’s vision statement points to highest profitability compared to major airlines like United and Delta. Such global industry leadership must address opportunities and threats, such as those identifiable through a PESTEL/PESTLE analysis of Southwest Airlines Co. Considering its corporate vision statement, the company needs competitive advantages to prevent other airlines from exploiting the same opportunities in the global air transportation market. 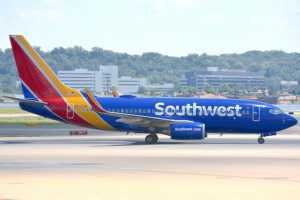 Furthermore, to achieve the “most loved” objective in the corporate vision statement, Southwest Airlines Co.’s corporate social responsibility strategies must secure a positive brand image. Based on conventions on writing business vision statements, the company’s corporate vision is satisfactory because it contains specific long-term targets and criteria such as “most loved,” “most flown,” and “most profitable” in the global airline industry. Southwest’s corporate vision statement is detailed enough to guide strategies and to inspire employees to make the enterprise the best in the industry. However, considering possible improvements in the vision statement, it is recommended that the company add details about how it plans to achieve such leadership, such as, possibly, through cutting-edge technology, business process changes, and other factors relevant to the airline industry. Grünig, R., & Kühn, R. (2018). Stakeholder Analysis and Revising the Mission Statement. In The Strategy Planning Process (pp. 77-83). Springer, Berlin, Heidelberg. Lin, Y., & Ryan, C. (2016). From mission statement to airline branding. Journal of Air Transport Management, 53, 150-160. Price, W. H. (2012). Vision Statement Impact on Organization Strategic Roles. Business Journal for Entrepreneurs, 2012(1), 27-42. Southwest Airlines Co. – Proven Business Strategy. Southwest Airlines Co. – Purpose, Vision, Values, and Mission. Suranga, J. M. (2014). Importance of Corporate Vision. In Proceedings of International HR Conference (Vol. 1, No. 1, pp. 34-40). Tomek, G., Vávrová, V., Červenka, P., Naščáková, J., & Tomčíková, M. (2016). Corporate vision from management development in the globalization context. In Production Management and Engineering Sciences (Vol. 297, No. 303, pp. 297-303). Routledge, GSE Research.